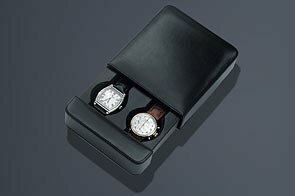 Venlo Travel Watch Case Italian Leather Biella 2 holds two watches for travel or storage with up to a 48mm dial. It is rare that the stylish man travels with one watch anymore. In fact, it is not the norm to pack more than one timepiece during travels. Venlo offers the perfect solution for such travel needs with a collection of sleek and stylish travel cases. Venlo's entire Italian Leather Collection is meticulously designed and hand-crafted at the factory outside Florence, Italy by experienced craftsman. Blending functionality, quality and style to create truly unmatched luxury cases. These cases are built on solid wooden frames, specifically designed to protect a fine timepiece and writing instrument. The frame is generously padded and wrapped in non-tarnishing Alcantra suede, providing comfort and security for the contents. Using only the finest and richest calfskin leather to finish these cases and all hinges and locks are nickel-plated. The leather collection is perfect for the discerning collector who seeks nothing short of the finest leather products. Specifications / Functions: Holds 2 watches for travel or storage. Watch Dial Capacity: Can hold a 50 mm dial. Exterior Dimensions: 6.5"x 5"x 1.5"
Genuine Product from Venlo. Buy from us with confidence. Brand New Product. Guaranteed for quality. GrandLuxPens is an authorized dealer of Venlo. If you have any questions about this product by Venlo, contact us by completing and submitting the form below. If you are looking for a specif part number, please include it with your message.